Ingredients: 100% natural Black Cardamom (whole fruits with seeds). 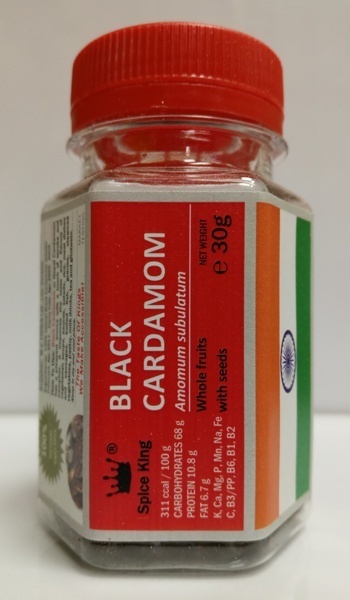 How To Use: Black Cardamom or Nepal Cardamom has a pleasant aroma with a touch of smoke and camphor, it improves the taste and flavors of vegetarian soups, sauces, salads, rice, meat dishes and sausages, boiled fish, gravies, steamed vegetables, pastry, milk drinks, tea and glintwein. 30 g net weight (100ml PET jar) - USD 2.20 (USD 73.33/kg).